Oh sure, who doesn't want a medium-sized, four-door pickup with a stout yet thrifty diesel engine that doesn't look like the fever dream of a barnyard welder? 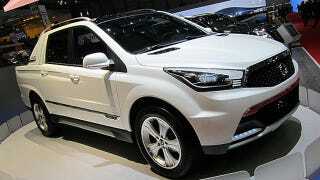 Thanks to Ssangyong, European and Asian buyers will get one similar to the SUT 1 Concept. Built a few ticks shorter than a Honda Ridgeline, the SUT 1 gets motivated by a 2-liter diesel four-cylinder churning 153 hp and 265 lb.-ft. of torque, hooked to either a hand-controlled or machine-stirred six-speed transmission. While it suffers from some of the stray exterior creasing common in Asian brands, the SUT in these shots strikes a nice balance between everyday driver and faux ruggedness. And just like the next-generation Ford Ranger and Volkswagen Amarok, the SUT 1 will never honor our Home Depots with its presence. Yes, we know, why would anyone buy one of these when a full-size pickup can be had for less than $20,000 and a Ram with a Hemi for not much more that. The rest of the world will get their shot at the Ssangyong later this year. We'll just go stick a potato in a Chevy Colorado's tailpipe, if we can find one.